Details matter. Sometimes, we might be tempted to overlook or forego the little details, thinking that they would never be noticed and never be missed. 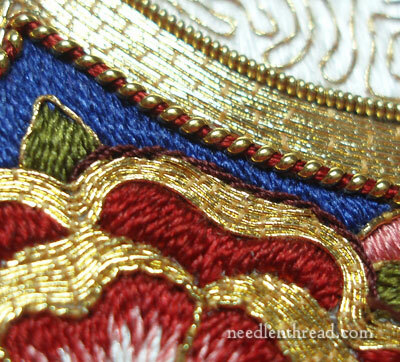 But in hand embroidery, it’s often the little details that make the biggest difference. 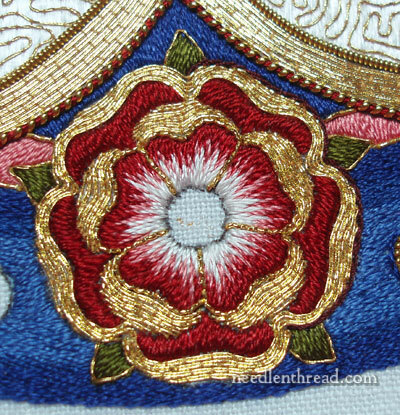 After finishing the goldwork on the petals on the first Tudor rose on the Medallion project, there was a side of me that wanted to forego some detail work. Pressured by time and by a certain weariness with the project – yet still driven by a great eagerness to see the whole thing finished and the design completely realized – I was sorely tempted to skip some of the detail work. One particularly bit of detail work I considered giving a miss was the dark outline around the Tudor rose and the inside petals of the rose. You can see in the photo above that the outside of the rose and the inside petals are not at all outlined. Do they have to be outlined? Not necessarily – there is a finished look about them already. But outlining provides more of a finish. It provides the illusion of shadow. Outlines on this type of embroidery make the elements pop out. Outlines give depth, where there is no depth. But they are detail work. And would anyone really notice if I decided to forego the outlines? There’s a saying that “the devil is in the details.” How do you interpret that? I’ve always thought it meant that, when you get to the detail work, that’s where you run into problems. That’s where you discover the little irritating difficulties, those little things that you didn’t see before. Facing the detail work, especially details you think no one will ever miss, requires a certain determination to forge ahead and overcome, no matter what obstacles crop up. Sometimes, it’s just devilishly hard to face the little details! And then there’s another saying – “God is in the details.” I don’t know which saying came first, but this one presents a different perspective on detail work. The notion is that perfection is found in the detail – that the “whole” of the thing is only realized when the details are realized. And while I struggled with the question of whether or not I’d actually bother with the details, I came to the realization that, even if no one else noticed the detail, I would know. Keeping in mind that the work is to be seen from afar, wherever I want a shadow or a clean outline, even if there is already a hint of a shadow there created by the stitching, this hint has to be exaggerated in order to be seen. This is where outlining comes in. Soie 100/3 is the Perfect Silk for outlining. It is a tightly twisted, fine silk thread. It is The Thread to use for sharp outlines around goldwork and other embroidery, where you want to add the hint of a shadow or the neat, sharp finish of the edge. For the detail work around the Tudor roses, I chose a very dark red-brown, and the stitch I’m using is the stem stitch. 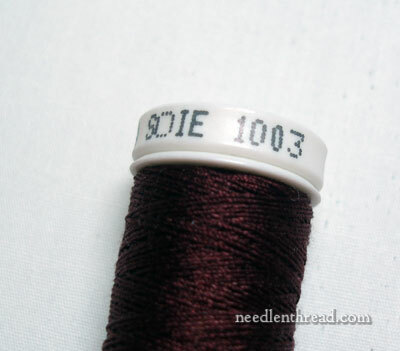 Soie 100/3 is a z-twisted silk. In order for the stem stitch to maintain its rope-like, twisted appearance, the stem stitch has to be worked a little differently when stitching with a z-twisted thread. 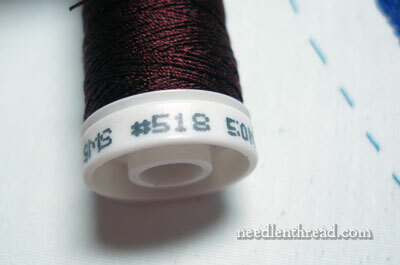 You can read about this in my previous article on stem stitch with z-twisted threads. When working the stem stitch with the Soie 100/3, I also use a laying tool, because it makes it easier to place the stitches and to avoid twisted thread during stitching. And here is the rose, outlined with Soie 100/3. Using Photoshop, I put together two halves of the rose, so you can see one half with the outline and one half without. Can you tell which is which? Do you think the extra step of outlining worth it, or not? Have your say below! If you would like to follow along with the Medallion Project from beginning to end, learn a bit about the backstory, or pick up some of the tips and techniques discussed along the way, you can find all the articles pertaining to this project arranged chronologically on the Medallion Project Index page. Yes – it is complete! And when the wholeness is achieved, there is an incomparable blessing in its beauty. Your photoshop rose is a subtle piece, but the difference IS noticeable…thank you for taking the time to show me how important it is for any project to not give up and to take the time to get ‘it’ just right. in other words…the roses are now in bloom! Wow! I think you nailed it Mary! The outlining completely finishes the work, provides the added shadow you discussed and it smoothes out any edges in the gold thread and makes them look smoother, like a flower petal would look. I think your work is beautiful, and I so admire that you are willing to discuss your work so openly with us. I learn something from you every day. I often want to move on to the next project and think the details won’t matter. But they do. And now I always try to see them through. I think your shadow outline is the perfect final touch. I definately like the outline around the rose… it’s amazing how three dimensional it looks once the outline is added. God is in the details and with my stitching I know it’s worth the time! Such a glorious project… thank you for sharing this with all of us! I know that if it was me I would feel tired by now, but that extra mile would make all the difference. You have made such a beautiful work of art that to stop just before full completion would be such a shame. I would definitely do the outlines round the roses. I’m really looking forward to seeing the completed embroidery. I have to say, it looked great before, but with the added outlining it looks amazing. It really does add a depth and makes the gold pop even more with the added contrast. I agree with Pamela Beach–the amount of detail you’ve gone into with this project has been eye-opening and I feel like I’ve learned a lot just from following along with your progress! The outlining adds so much to the piece. It really takes the work from beautiful to stunning! Thanks for showing us this important final step. I have to say, yes, it’s more beautiful with the outline. I sympathise, though, with your fatigue! Been there before! Great job – thanks for sharing. I learn so much from your site. You are so right. That little bit more makes everything stand out clearly. Your work is very beautiful and I’ve been enjoying this series so much. That outline really makes all the difference in the world. Incredible how just stitching the outline can really just make it come alive. Hmmm…there’s definitely a difference, but I can’t decide which I prefer as they both look good. However, when you consider how many years–decades–your work will be appreciated by those who see it, a few hours on this end doing the finishing work isn’t all that much, really. Mary: The outlining makes the Tudor Rose much more defined. All you have to do is stand away from the computer and you can see the difference between the right side outlined petals and the non-outlined left side. I can hardly wait to see the centers filled in. Keep working! Definitely outline, Mary! It makes a big difference and I imagine it really will when viewed from afar. My interpretation: The Devil is in the details because the temptation is to NOT take care of the details and those are what bring us closer to the perfection of God. Thank you for the joy you bring us. The outline is definitely worth it, gives it that finished look. I have to agree about the details. After you added the outline, the rose is complete. I totally agree, the outline is a small detail but it makes a BIG difference. It makes everything look right the way it should. Good work! Absolutely worth it Mary. Even I can spot the difference, even from the photos. Definitely worth doing. Given that you have previously told us that this would be seen fromn a distance, yes the underlining is necessary. It gives definition without being obtrusive. Mary, they both look good, but I’d have to say the outline looks much more defined and lovely. Yes, it’s devilishly hard. Yes, it’s a ‘detail,’ after all. Who would ever know? Yes, it makes all the difference. It’s well worth it. You would know, and that’s reason enough, but it really does give the depth needed. For such a fabulous piece as this, it all has to be fabulous. And it is. Yep–the outlining adds that finishing touch that makes it look completely done. Where can I get me some of that Soie 100/3? It’s a lovely piece; can’t wait to see the whole thing, completely finished. I think it really finishes it off nicely. This piece of work is absolutely beautiful. Thank you for allowing us to follow your progress. I can’t wait to see the finished item. Mary, I never would have realised what a difference in appearance there is by outlining the goldwork. It looks truly stunning. Would you mind telling me if you used the Soie D’Alger silk please? To outline a design seems like a minor thing when you have completed so much of a project. But it does make a difference especially when you step back and look at the design as a whole instead of just one segment. Absolutely! The outline finishes it and sets it off! Mary, The Medallion is absolutely beautiful. I know how eager you are to finish but I think you really need to outline the Rose. It looks much better that way. You are an inspiration to me. Keep up the great work. The outline brings an additional demension to your beautiful work. It is wonderful to watch and learn from you and I am very grateful each day for your website and emails. It is inspiring to see techniques of the great art Masters put into needlework – such as your addition of the outline. Awesome! As for the quotes – Maybe God and the Devil are both in the detail -which makes for the struggle! It was worth it in many ways. The shadow is fine detail that adds dimension to your already lovely work. The addition of color smooths the connect from the background to the rose. And yes, you (and we! )know that you went through the effort to complete it. Kudos to you for sticking to it! Looking at it in the closeup shot, I like the outline outside but (don’t shoot!) would forgo the outlining of the inner gold petal, since I think it makes it look like 2 blooms one layered over the other. Experience has proven to me, though, that outlines are one of the aspects of design that need both a close-up and a normally-viewed-from distance view to get the whole “picture” and it seems to me that embroidery is particularly subject to that “rule”. So for me, hard to say with only part of the equation. “God is in the details” is new to me. I like it much better with the outlining Mary. May I also say this is the loveliest thing you have ever done…it`s just so beautiful!! How can you bear to part with it??? Sorry to disagree after all of your hard work; but the rose actually looks better without the outline. The outline flattens the image and makes it appear much less natural. It’s a shame you spent so much time on it. Otherwise, a beautiful project. With all the work you have put into this Medallion Project I would go for the half with the outline, great crowning touch! I feel it looks better without the additional outlining because of the strong lines around the other areas. There is too much attention competition. Also, I feel that the roses look too “animated” and not as woven, too dimensional. But that’s just my humble opinion! The majority seems to agree with your choice. No matter what, it is simply gorgeous! Thanks for sharing. Yes, yes, the outline detail is definitely needed to “finish” the piece”. It is beautiful as is, but looks finished and complete with the outline stem stitch. The effort is worth every minute of additional work. Thanks for sharing with us! I have followed this project closely and wished I had the talent to do something like this. I do, like you, believe that detail does count and somehow outlining makes a huge difference to a piece. I have done a few Michael Powell X stitch designs and without the backstitching it looks like nothing at all but when you add that detail everything comes to life so I have to say this particular detail you are questioning is definitely worth it. What a marvellous piece of stitching this is and how proud you must be of what you have achieved here – how lucky is the person that will eventually own this! No question. The rose has now bloomed. wow, it is certainly well worth the extra “time & trouble”…and the pictures make it evident to me why it shouldn’t be overlooked. although I agree I’m tempted to take a short cut if I can…but whew Mary, this is so much more with that little detail! I can tell the difference. It looks fine without the outline, but the outline makes it pop. You always do such a good job of explaining why you chose to do things one way and not another. Thank you so much for sharing your insights. yep! luv the outlined version…I cannot wait to see this completed…it is soooooo beautiful! ty …I really enjoy your posts and your fantastic knowledge base..wonderful blog! Outline! It is in the details–!!! To me, the outlining gives the 2-dimensional rose a sense of unfurling into a 3-dimensional space, and a rich contrast/shadow effect. Good choice! You put a frame around the 2 areas and made them more outstanding. Sorry Mary, the detail is worth the effort. It’s just so lovely. After all the time you put into this piece, outlining was definately worth it! It should be as perfect as possible. The outline definetly makes a difference – it makes the rose pop and gives it more presence. Gorgeous, inspiring work, as always! I tried Carolyn’s trick (#14 comment) and agree. Once I stood up and walked much further back from the screen, the rose with the outline definitely popped. Given that this will be much smaller in real life, and farther away from the congregation who will be looking at it, this is such a great finishing detail. Oh yes. Much better. The fabric was slightly visible between the colors, and, as you say, YOU would have known. While the unfinished work is beautiful, I have to say that the outlining makes enough of a difference I’d feel it necessary. Beautiful! The good news is that you are right. The harder news is that you have created more work for yourself. But if you didn’t do it, it would bother you more. I am inspired by your patience. Between you and Kathy (over on the Unbroken Thread)I learn so much! The internet is really a wonderous thing! I definitely agree that outlining gives the piece that certain oomph. I could see the difference, and if you hadn’t shown us this, I would never have thought anything of it. Mary, the outline is definitely worth it. The side of the rose without looks flat. With the outline it has depth and dimension. It was worth your effort. P.S. I had to spend 4 days with my daughter’s 2 big dogs and no TV so I took embroidery and her computer kept me in touch with all of your videos and tips. Thank you for keeping me company. 1.How did you do the stem stitch? Assuming the material is taut, how did you manipulate your needle? Found those recipes in an old book. Someone looking at the “un-outlined” piece would never think that an additional finishing touch could make it even better. But the outlining does exactly that, and the whole work achieves perfection. I am dazzled by your artistry. I believe in outlining even with just regular embrodiery thread. Suzanne Marshall outlines with regular thread and what a difference it makes in her work. Even before I was introduced to Suzanne’s outline techie, I was doing it and what a difference it makes. And so I believe that your outlining on the rose just makaes the rose pop out. Keep on making us do the little things to make our work better. Your work is beautiful. Mary,your work is exquisite! I am sure the inclusion of your detailing stitches provides the WOW factor. Thank you for your very visual explanation. It shall come to mind the next time I am tempted to skip a step in order to hurry to completion. And will cause me to evaluate a design for any details to add for a truly complete project. I enjoy your teaching tips! You do such beautiful stitching, that I don’t think the outline is necessary, but a less qualified embroiderer may need it to hide flaws. I liked yours without it honestly, I think it lets the gold shine more. Sometime you get to skip the dratted details. Sometimes you don’t. I think this is one time that you don’t. It does look good without the outlining. BUT, it looks even better with it. Sorry. Well, though I sometimes don’t like to admit it, the details do matter! They might only matter to you, but if you don’t do them, you will know. When you look at your work, the lack of that detail is all you will see. The flower petals do look so much more finished with the brown outline. I mightn’t have realized that, but once you did it and showed us, it’s just got to be in there because it makes a difference. Personally, I prefer it without the outline & would have left it off. Personal preference is what makes all us stitchers produce unique pieces. And this is beautiful with or without. I’m all for the outlining. It makes the rose distinguished-looking and the silk line doesn’t allow the rose to sink into the background. You need to be congratulated to have accomplished this amazing piece. Your artistry, attention to detail and skill is evident throughout the embroidery. Congratulations for a job well done. Hi Mary. I can’t tell what it looks like from farther away, but up close, I think I like it better without the outlining. I’m sure the difference from a distance is subtle and accomplishes your purpose. I’d love to see photos of that. The whole project is amazing. The devil is definitely in the detail, and when it is done, he is put out for good as everything that can be done for completeness has been done … no place to hide. What a big difference the detail makes. I love the way you write with personality as much as the excellent advice you give. Usually I would say that outlining finishes a piece and makes the details pop. But this medallion is so brilliant that I cannot decide which side is best. They are both gorgeous….just different. Great job!! Yes, the extra detail is worth it. The right side of the rose pops, while the left side just lays there. WOW what a difference with outline stitch. I liked it without the outlining. Wow, it does make a difference. It looked finished before you added the outlining. All of your photos are close up. I’m guessing that if you step back, the outline works even better to add depth to the roses. Thanks for another terrific insight! It adds another dimension-you do lovely work. You are right – the dark finishing was the right thing to do – it added amazing dimension to the image. I could hear myself in your writing – so often I balk at the detail, but when done, I am more than happy I put in the extra effort. I am so loving this piece of work, as my late mother did ecclesiastical embroidery and I did not realise just how much I love it! Outlining is definitely worthwhile – it seems to give more depth to the flower and sets it off perfectly. Mary, Your attention to this detail is what makes you STAND OUT FROM THE REST. I think the outlined looks fantastic, although even without, it looks also fantastic. Yes I can see the difference and in my opinion its just what it needs. Lovely!!! It changes it from good to great. Definitely worthwhile! I know you would rather I said no, BUT I really think the outlining should be done, as it really does show off the rose, making the your whole project so much more professional. So true…your roses are beautiful! Outlining makes all the difference in embroidery. I’m a supporter of “God is in the details”; in everything we do really. Mary, I think the outlining really is the God in the details. The rose is just stunning with it. When Lorenzo Ghiberti sculpted the bronze plaques that make up the Gates of Paradise in Rome, he knew that most of them would be too high up for people to see from the ground. In 2008 the bronze plaques were on display at the Seattle Art Museum, where I saw them. I was stunned by the tiny details in the first plaque, the one that would be at the very top. This was the one that only God and the artist would know about. In that scene, which depicted the Garden of Eden, Ghiberti had placed two tiny lizards, three smaller horseshoe crabs, and a dandelion. For almost 500 years, only God could see those creatures and plants. It was done for God. You are making the vestments for the priest-to-be, but you know that God is the One you are really making it for. When I was embroidering the Lent/Advent alb for my priest, I knew that I could have gotten away with little mistakes, knowing that he might not ever notice. But, I knew that God would see my work, and I do my best work for Him. I have really loved watching this work step by step. Someday, I hope to be as skilled as you. Thank you so much for sharing this with all of us. You are most generous! And, I still think that pink in the outer ring is just fabulous! I know that the young man will be so awed and overwhelmed with your painstaking concern and care in embroidering this medallion for his ordination. The detailing gives a sharper definition to the edge when compared to the other half which to me looks slightly blurry. So so SO worth outlining it. The edging really makes a difference. Like you, I love to try and winkle out of those little finishing touches (mostly with knitting) but guilt always makes me knuckle down to those details and I can’t remember a time I’ve regretted it. The impact of the work in the roses is definitely highlighted by the subtle choice of edging colour that makes the rest of it pop (especially love the contrast between the petal and edging colour). Wow, I would not have guessed it, but that outline makes a lot of difference. You’re right, it was fine and beautiful without it but with the border it is popping! I have been following your website for a while now and am so impressed and pleased. I recently retired and one of the things on my list was to re-open the book on embroidery from childhood. I am so pleased that you offer so much free advice and on many subjects within this art. I was convinced that the art of hand Embroidery was pretty much lost but you have proven it is not. I just love the Jacobean patterns on the free pattern page and intend to try that at some time in the future. I really don’t think I am ready for that just yet as I now realize I have a lot to learn. About the outline, yes I believe it is in the details and you’re right that it is the creator that may get the most satisfaction from adding those finishing details that someone else may not even notice unless provided with a comparison. That leads me to a question, and I can tell that you like receiving questions. Is it better to do the outline after all the other work is done or do the outline first, say, around the outside of an Initial and then do the filling in? Glad you enjoy the website and that you are re-opening the book on embroidery! Nice to hear! Concerning outlining and filling, it depends on the type of outline and the type of filling. 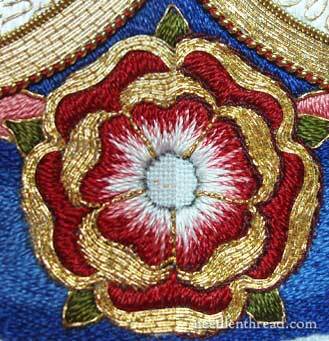 On the rose, for example, the outline should be done after the goldwork – or at least after the goldwork that is in direct contact with the outline. I’m going to show some alternatives on this, actually, because I did part of the outline a little differently on subsequent roses. For something like the monogram in the center, the outline should be done at the end as well. I think when the stitched element is defined (in shape and size) by the “filling” (or whatever stitches make up the main element), and the outline is simply to “touch up” or to add shadow or depth, or to “finish” the piece, then the outline should be done last. But there are times when the outline should be done first – I’d say when the outline defines the shape and size, and you are using it to restrain the element to exactly that shape and size as determined by the outline. So, for example, with the goldwork dots in the middle of the roses and in the outer edge of the medallion, the outline around those dots actually define the dots. The outline in this case is worked first. Also, with the chip work that fills the dots, it’s necessary to have your outline down first to constrain the irregular shapes of the chip work. So, again, it depends. I’d say in the majority of stitching cases, the outline would be done last, but in some cases, it is done first. Of course, I’m talking about outlining that will be visible when the piece is finished. There are types of outlining that are done first and then stitched over to raise and define an edge (say, with satin stitch or long and short stitch). Hope that makes sense! I’m planning to revisit that subject a bit later, too, so I’ll do my best to clarify it as I go! You are absolutely right – no one would have noticed the lack of outlining, but it does make a difference when it is done. The Photoshopped side-by-side was a great demonstration. Please do continue with the outlining. Mary you are progressing beautifully and I have to agree, the outline is the right thing to do. Stunning work. Outlining gives it wonderful depth and beauty. Gotta do it! Oh, Mary, this rose is so beautiful! Do I love it without the outline? Yes. But . . . when I see it with the outline? Well, you said it, ” God is in the details.” My father used to say, “If you’re going to do something, it’s worth doing right.” That’s what urges me on to take the time to do a project correctly (and to the best of my ability). The outlined rose soars! I really love the way you embroider. I really think the outline sets off the rose to its full advantage. What a beautiful project it is. Yes, it DOES just finish it… The photoshop exercise was very useful. It is kind of like omitting mascara when making up your eyes… It makes the rest pop just that little bit more! Beautiful work! Well done!! Honestly, up close I like it better without the dark-brown outline. Yes, that’s a testament to your embroidery skill – you don’t need the outline to hide anything! But as you note, the majority of the congregation only ever sees vestments at a distance – a couple feet at communion; more like a minimum of 10′ to 50′ any other time. I am curious about how long it has taken you to complete the medallion project? Also, are you going to be making the rest of the chasuble, or only attaching the medallion to an already made one? 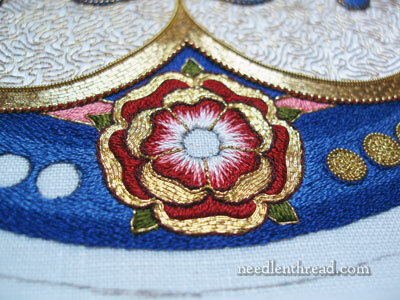 The Tudor rose is so lovely, but with the outlining, it becomes a masterpiece. And you are the master – or mistress – that makes it happen. Thanks for sharing your beuatiful works with us. I think the outlining is important – which stitch did you use for the outline – If you just permit me a slight observation I find the outline a little thick but maybe from afar it gives it depth. Well done lovely work. Previous Previous post: Au Ver a Soie Silks – New Colors Rolling Out! 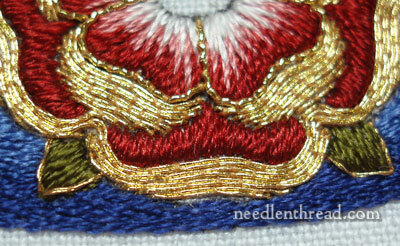 Next Next post: Mellor Goldwork Tool – It’s a Handy Thing!